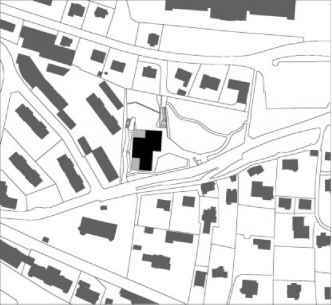 Site plan of the school in relation to the public footpath across the site. La Maladiere Primary School occupies the southeast corner of the former Du Mail cemetery/park. The project negotiates the topographical conditions of the site - the covered playground below the cantilevered first floor is also part of a public footpath running across the site. And the elevations are articulated as a regular grid following the building's compact yet complex geometry, with fibre-cement panels, in three different tones, outlining the square metal-framed windows and expressing the structural steel frame. The classroom planning, however, provides flexible options: the interior partition walls are constructed as a dry-wall system allowing future changes to take place with minimum disruption. The three teaching floors and the sports hall in the basement are accessed via a single staircase from the entrance hall. The building's volumetric appearance and gridded, skin-like facade appear to be independent of the internal layout. 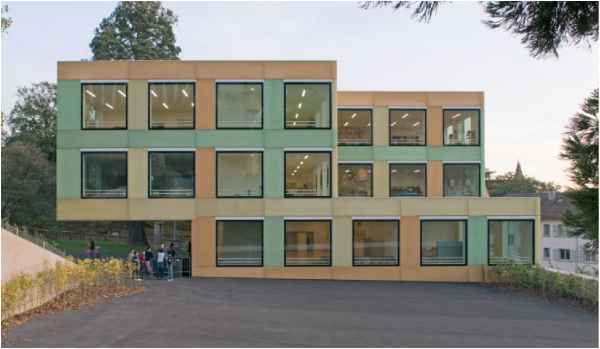 The colour scheme and materials - inspired by the context of the site -articulate the architect's idea of the building as a 'playful and shining object in the park, representing the lightness and openness of the school'. 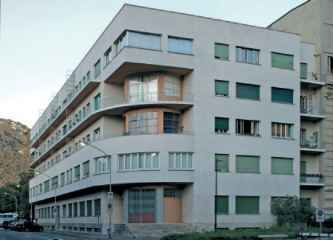 The rectilinear geometry and the flush facade detailing also suggest a desire to design the school as an object in its own right - rather than responding to, or directly translating, social or functional requirements. Each elevation has two corner details that alternate around the building and, together with the changing tones of the cladding, combine a sensuality of construction with the rationality of the grid within. View from the north showing the cantilever over the main entrance, the building's volumetric composition and the two different corner details of the facade.